Sir Alex Ferguson said earlier this month that he would only consider acting in the January transfer window if a player that he had been tracking for a long time became available, and Tuesday’s rumours suggest that could be the case. Wesley Sneijder has been linked with Manchester United for a number of years without a deal ever being completed, however there are reports that Inter are contemplating cashing in next month to raise funds for other business. Many thought that the Dutch playmaker would arrive in the summer to replace Paul Scholes, but injuries to the likes of Darren Fletcher have seen midfield options grow scarcer, and it will be hard for Ferguson to resist again if he is up for grabs. After losing Samuel Eto’o in pre-season, Sneijder is without doubt Inter’s prize asset, yet they have been forced to cope without him for the majority of this campaign due to injury, with him managing just seven Serie A appearances. That was no doubt a factor in their uninspiring start, especially as when he featured it was often out of position, though their recent climb up the table under Claudio Ranieri has been achieved in his absence, indicating that they can flourish without him. And while the 27-year-old is clearly a star man, Inter’s main problem since their 2009-10 Champions League success has been failure to replenish the squad, and with finances not great, they may need to sacrifice Sneijder in order to do that. Ranieri has admitted that he wouldn’t want to sell the former Real Madrid man but refused to rule it out, and the player has hinted in the past that a move to the Premier League champions and 6/5 second favourites to retain would appeal. 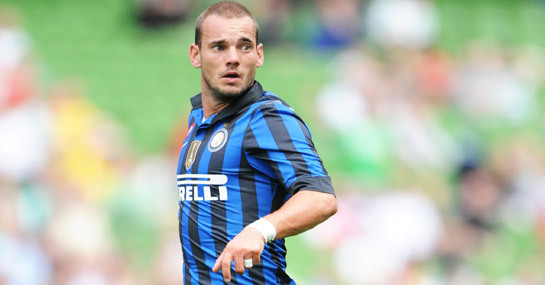 Wages threaten to scupper negotiations though, as Sneijder is believed to earn around £200,000-a-week with the Nerazzurri.